NASA’s Goddard Space Flight Center Scientific Visualisation StudioA map of Antarctic ice flow speed. 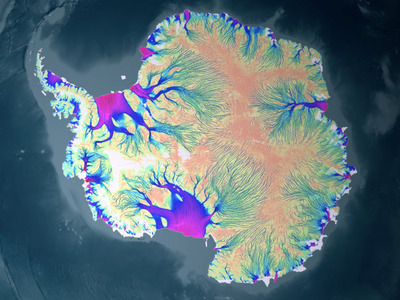 Antarctica is warming faster than most places on Earth, causing surface melt. Melt water below the continent’s thick ice sheets lubricates their movement toward the ocean. A new study backs up the idea that a hot plume of rock in the mantle is sitting below West Antarctica. This plume may contribute to higher-than-normal ice losses in West Antarctica. Antarctica today takes a lot of heat from above, thanks to two hundred years of carbon-belching human activity and the warming this has caused. An increasing number of researchers also think the frozen Southern Continent faces significant warming from below: Hot rock pluming upward through Earth’s mantle, leaking heat through the crust, and melting the bottoms of Antarctic ice sheets. The effect, first proposed 30 years ago, seems especially strong in West Antarctica, where ice sheets losses are most dramatic and contributing to sea-level rise. But few scientists believed this was happening, at least initially. 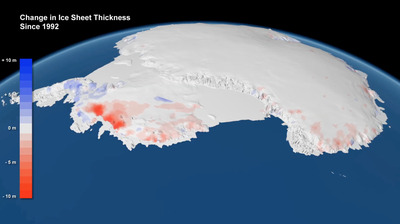 ESA/Planetary VisionsSatellite measurements reveal thinning in ice sheets is most dramatic in West Antarctica. However, a new study by Seroussi and others now backs up the idea of a hot mantle plume — and the melting it causes — with advanced computer modelling. The work was published September 1 in the Journal of Geophysical Research: Solid Earth. Earth’s internal heat is always warming up the ground, including rock under ice sheets all over the planet. While this partially melts them from below, snow and ice accumulation on top is usually enough to balance out these losses. Over the years, however, researchers who study Antarctic ice melt have detailed an anomaly at West Antarctica. There, ice sheet thinning is more drastic than anywhere else on the continent, according to satellite data. Since the industrial revolution, the North and South Poles have warmed at a rate many times faster than other locations on Earth. In Antarctica, this is melting ice sheets from above and pooling water on top of them — possibly helping carve off Delaware-size icebergs. But a warming climate does not fully explain Antarctica’s mounting ice loss. So in recent years, researchers have looked deeper for an answer. NSF/Zina DeretskyAntarctica’s system of sub-glacial lakes (light-blue dots) and rivers (dark-blue lines). 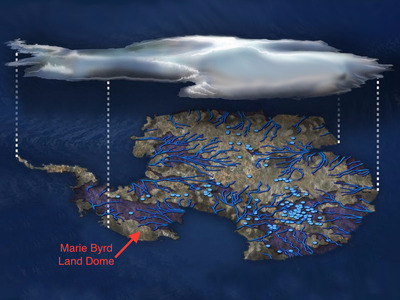 The Marie Byrd Land Dome (red arrow) sits below West Antarctica. One line of research has discovered, documented, and even drilled into and explored a vast system of sub-glacial lakes and rivers. This water helps lubricate the movement of ice sheets from the snowy mountains to the sea — and certain parts of the Southern Continent, where there’s a lot of sub-glacial water — are moving and melting faster than others. Scientists have also dug into the mystery of a bulge in Earth’s crust below West Antarctica, called the Marie Byrd Land Dome. At first, it was thought the crust was thicker there. But earthquake-like seismic measurements disproved that idea. 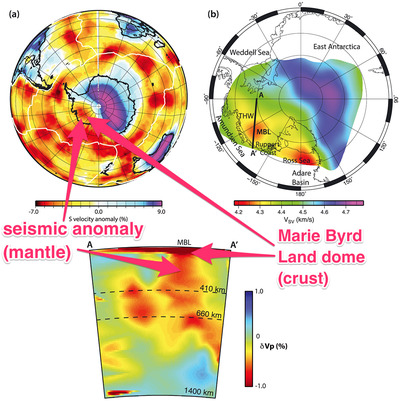 Helene Seroussi et al./JGR Solid Earth; Business InsiderSeismic measurements suggest a hot plume of mantle rock below West Antarctica. Since this could just be an irregularity in the mantle, Seroussi and her colleagues borrowed from a computer model used to simulate the giant plume of hot rock below Yellowstone National Park. Researchers plugged in all of the known physics about the mantle, Antarctica, and its ice sheets — including their changing altitude, movement, friction caused by that movement, melting rates, and more — and produced dozens of simulations, according to NASA JPL. Those simulations showed that heat spilling from a hot mantle plume could be up to three times greater than it is for a normal, non-volcanic chunk of mantle below the US. And compared to mantle below Yellowstone, the heat output could be 75% that of the volcanically active region. When the researchers compared that heat output to basal (or bottom) melt rates in Antarctica, no places matched — except for West Antarctica. 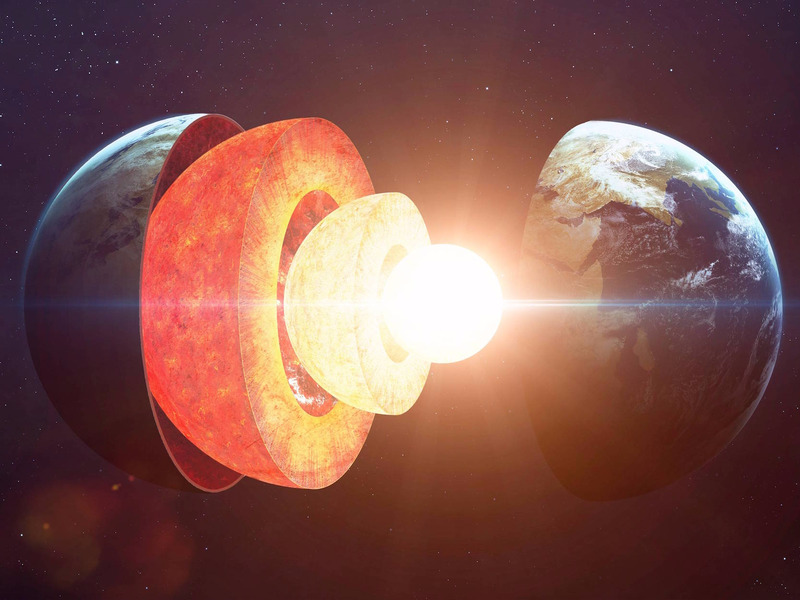 At that location, a crack or rift in the crust may be allowing heat to rapidly escape upward, the researchers wrote in their study.